View 4th of July Photos On Crestwood's New Website!! The Crestwood Citizens Association is excited to spread the word about the newly-redesigned Crestwood website! You can still access the website at the same url as always:www.crestwood-dc.org, and the url crestwooddc.org will also work. (CCA email addresses will not have the hyphen). Crestwood's website has been a source of valuable information and updates about the neighborhood for many, many years. We hope you will enjoy the refreshed site - all the old content is still there, and we hope that the new website will provide additional opportunities for neighbors to connect with one another. To get you started, we invite you to take a look at the photo album for the 2017 4th of July Parade. We had a fantastic turnout and got an inadvertent relief from the heat with a NYC-style fire hydrant sprinkler! 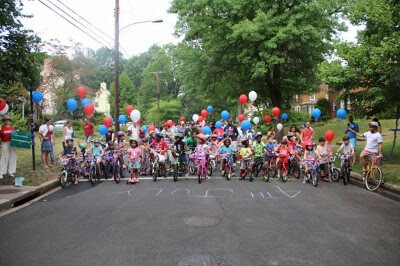 Thank you to everyone that walked, biked, decorated, attended, brought delicious breakfast treats, and helped set up. A special thanks to Harriet Winslow for coordinating the event! While you're on the website, please take a look around and let us know if you have any comments - it's a work in progress! At the top right of the website you will see a profile icon - that is what Association members will be able to use to manage their membership (if they want to), and where neighbors can sign up for membership and pay dues (only if they want to!). More information on online membership management will be sent soon. You don't have to use the online membership management option - you can always join the Association at an event or by contacting treasurer@crestwooddc.org. Any questions or concerns - please email info@crestwooddc.org. Thank you for your support! It enables us to sponsor all of these FREE wonderful neighborhood activities and programs. The Association is open to all Crestwood residents, and the cost is $25.00 per family, annually. Individual member cost is just $20.00. Crestwood Citizens Association Annual Fourth of July Parade!! Annual Fourth of July Parade!! 9:30am - to decorate bikes, strollers, scooters and enjoy breakfast munchies. 10:00am - the Parade will begin! Location - Gather in front of 1810 Shepherd St. NW. We will enjoy muffins, bagels, coffee, and juice while the kids decorate their bikes, scooters, strollers, wagons, and anything else you would like to bring! Parade Route: The Parade will start at 1810 Shepherd Street and continue to 18th to Taylor to Argyle and back to Shepherd. Everyone in the community is welcome to walk or take a seat and cheer on the parade! Please spread the word to your neighbors! If you can, please bring breakfast food or beverages to share with the group. If you are able to assist with bringing decorations or have questions please contact Harriet Winslow at hcwinslow@aol.com. We have just received a letter from DDOT regarding ANC 4A's Resolution and request that Phase II of the Beach Drive construction project be split into two segments to allow Crestwood residents continued access west of Rock Creek Park via Blagden Avenue. DDOT has indicated that they will not be following the ANC's recommendation, and that Blagden Avenue will end in a dead end during Phase II, as was originally publicly stated. As you can see in the letter, DDOT cites safety concerns as well as constructability and timing concerns as reasons for its decision. DDOT states that the work, if done in one segment, is expected to take approximately four months, as compared to an estimated eight months if Phase II was split into two segments as the ANC recommended. DDOT states in its letter that it will attempt to reduce the impact of the closure to residents using detours. The latest word from DDOT is that the work is expected to begin this summer. We will communicate if and when we get additional information on the timeline. Commissioner Black and the CCA are evaluating the letter and what, if any, response will be made to DDOT. Please email president@crestwooddc.orgwith any comments or concerns. On Tuesday June 6, 2017, the Crestwood Citizens Association and Advisory Neighborhood Commission (ANC) Single Member District 4A08 held a joint quarterly meeting at Grace Lutheran Church. Pastor Wendy Moen kicked off the meeting by thanking everyone in attendance and noting that she makes herself available to anyone that would like to meet, chat, take a walk, or otherwise connect with her. There was a good turnout, especially from Blagden Avenue neighbors, including what must be one of Crestwood's very youngest residents whose parents should be commended for teaching the importance of civic involvement from such a young age! Jim Sebastian and Ted Van Houten from DDOT attended the meeting and presented an update on the status of the Blagden Avenue sidewalk design. Ted explained that the September 2016 Livability Study recommended a sidewalk be installed on Blagden Avenue to facilitate safe access to Rock Creek Park, and that the Study was part of the "planning phase" of the sidewalk. Ted further explained that DDOT is now in the "design phase" and will be conducting a field study and looking at other issues such as the location of utilities and catch basins in order to prepare a design for the sidewalk. DDOT will later be looking into other additions to Blagden Avenue such as a bicycle facility and a slow zone. However, at this juncture the sidewalk is the focus of DDOT's efforts. There is a possibility that the bicycle facility could consist of a shared use path/sidewalk. Ted and Jim confirmed that no final decisions have been made with respect to whether the sidewalk will be built on the existing roadway or on DC's public right of way. The option of the sidewalk being constructed entirely in the existing roadway is still on the table. Wherever the sidewalk is build in the roadway, Blagden Avenue will be narrowed and will lose one of the two existing parking lanes. DDOT is not able to provide a timeline for the design or construction of the sidewalk at this time. Speeding is a huge issue on Blagden Avenue. Signage hasn't helped. A stop sign camera was installed near the area where the sidewalk will be installed, and it issued 963 tickets in a recent month. Yet, the speeding has not abated. Constructing the sidewalk on the roadway and narrowing Blagden Avenue (referenced as a "road diet") would act as a traffic calming measure since the roadway would be narrower. In addition, constructing the sidewalk on the roadway would result in no loss of impervious surface and the loss of no trees. If Blagden Avenue is narrowed, DDOT should make sure that the Fire Department knows about it in case it affects how fire trucks can move along Blagden. If the sidewalk is constructed partially on the public right of way and partially on the road, there will be areas where the sidewalk curves out into the road. Given the speeding issues mentioned above, there is a risk that a driver could not see where the sidewalk curves and end up jumping the curb, especially on a dark and/or rainy night. If the sidewalk is constructed in the road, snow plows would plow snow right onto it, making it even more difficult for residents to shovel the sidewalk. The lack of timeline is an issue - there are a lot of children that use the area, and the current conditions, with people being required to walk on the street, are very dangerous. There would be benefits to having the parking lane be adjacent to the sidewalk, not on the other side of the street. For example, the safety of people exiting parked cars and of pedestrians and a mitigation of the snow plow issue mentioned above. It is important to remember that bicycles also use Blagden Avenue and for this to be considered in design considerations. The gaps in sidewalks throughout Crestwood are an issue, especially for the safety of children. Next Steps: When the design has come along further, DDOT will connect with the CCA and the SMD 4A08 Commissioner for comment. Crestwood residents will have an opportunity to provide comments regarding the proposed design. Jim noted that the input of residents, as well as the ANC and other criteria, are taken into account when DDOT makes its design decisions, with the ANC's position to be given "great weight." Mathewson Drive: There also will be a sidewalk constructed on Mathewson Drive. Initially it was to be constructed on the south side, now it looks like it will be on the north side. DDOT will issue a Notice of Intent for comment. Currently, the funding is only for Mathewson Drive, not for any portion of the sidewalk on Upshur - it was noted that adding a sidewalk to one house on Upshur St. would alleviate the current gap that exists and would provide continuity to the new Mathewson sidewalk. Residents noted that the access to the path at the intersection of Blagden and Beach drive is very dangerous, for both bicyclists and pedestrians. It is expected that this issue will be addressed as part of Beach Drive Phase II. Commissioner Black provided thoughts on the DC Comprehensive Plan as it affects Crestwood that have been presented to ANC 4A . Any Crestwood residents that have additions or comments should send them to the Commissioner or the Association ASAP. One resident noted that the future of Carter Barron should be addressed, which Commissioner Black agreed with. This comment period (which will not be the only comment period) closes on June 23. The Association will be endorsing these comments unless it hears otherwise. Dolly Turner from Councilmember Todd's office presented updates on DC Budget items that benefit Ward 4 including funding for school modernizations and capital improvements, childcare vouchers, Upper 14th Street Green Team, and for the Safe at Home Program for District Seniors. She noted that the Councilmember is following the DDOT issues closely. Ms. Turner also fielded requests for information and questions from residents for review by Councilmember Todd's office. On June 19 ANC 4A passed a Resolution on LED street lights, which tracks the resolution previously approved by the CCA. The Resolution recommends that DDOT use warm-white 2700 Kelvin LED lights for street light installations rather than the current 4000 Kelvin blusih-white lights. About ANC SMD 4A08: ANC Single Member District (SMD) 4A08 covers all of Crestwood and is the equivalent of census tract 26. The ANC 4A08 Commissioner is Gale B. Black. About the Crestwood Citizens Association: The Crestwood Citizens Association was formed in 1941 and corresponds to the Single Member Advisory Neighborhood Commission District, ANC 4A08. Its purpose is to enhance and protect the quality of life in Crestwood while giving residents a voice in city and community affairs. Learn more about the CCA at www.crestwood-dc.org. THE CRESTWOOD CITIZENS ASSOCIATION IS SUPPORTED BY YOUR DUES. WE ENCOURAGE ALL CRESTWOOD RESIDENTS TO SUPPORT THE CCA BY JOINING THE ASSOCIATION. Online membership management and dues payment (only if you want to)! On Tuesday June 6, 2017, Advisory Neighborhood Commission (ANC) 4A held its regular public meeting. A number of proposed resolutions were discussed and voted on including a number of resolutions relating to the Walter Reed site. In addition, representatives from Councilmember Todd's office and Mayor Bowser's office presented updates regarding new and pending legislation and the DC Budget. SMD 4A08 Commissioner Gale Black, in response to an inquiry from a community member in another SMD where a livability study has been proposed, described Crestwood's experience in reviewing and making recommendations on the Rock Creek East Livability study, including the current phase we are in, where DC has started implementing recommendations of the study and we are working with DDOT on design decisions and alternatives. The ANC passed a resolution proposed by Commissioner Black stating that the ANC supports using any funds or services that have been earmarked for the construction or repair of Carter Barron for that purpose only, and that such funds should not be re-purposed. The ANC also passed a resolution proposed by Commissioner Black calling for DDOT to respond promptly to ANC 4A's October 2016 resolution regarding the the construction on Beach Drive. The October 2016 resolution called for Phase II of the construction to be split into two segments so that Crestwood residents would continue to be able to cross Rock Creek Park from Blagden Avenue. Initially, Commissioner Black was going to propose a resolution regarding the design for the Blagden Avenue sidewalk, because it was expected that a Notice of Intent would have been received. However, we have been told that the design work is still being done on the Blagden Avenue sidewalk, and as such the issue was not discussed. However, there will be a discussion of the sidewalk at the joint SMD 4A08/CCA meeting on June 20 at Grace Lutheran Church at 7pm. Ted Van Houten, DC Department of Transportation Planner will participate. In addition, the June 20 meeting will be to discuss the portions of the DC Comprehensive Plan that relate to Crestwood. Commissioner Black will use the discussion from the June 20 meeting when considering her input into the ANC 4A recommendation regarding the Comprehensive Plan. About the ANCs: An ANC is a non-partisan, neighborhood body made up of locally elected representatives called Advisory Neighborhood Commissioners. They are a unique feature of the District's Home Rule Charter and were established to bring government closer to the people, and to bring the people closer to government. The ANCs' main job is to be their neighborhood's official voice in advising the District government (and Federal agencies) on things that affect their neighborhoods. Although they are not required to follow the ANCs' advice, District agencies are required to give the ANCs' recommendations "great weight." Moreover, District law says that agencies cannot take any action that will significantly affect a neighborhood unless they give the affected ANCs 30 days advance notice. This includes zoning, streets, recreation, education, social services, sanitation, planning, safety, budget, and health services. The ANCs may also initiate recommendations for improving city services, conduct neighborhood improvement programs, and monitor resident complaints. ANC 4A information is available at http://anc4a.org. About the Crestwood Citizens Association: The Crestwood Citizens Association was formed in 1941 and corresponds to the Single Member Advisory Neighborhood Commission District, ANC 4A08. Its purpose is to enhance and protect the quality of life in Crestwood while giving residents a voice in city and community affairs.Learn more about the CCA at www.crestwood-dc.org. I am so excited to have the opportunity to continue the great work that Karen Howard and John Mahshie, Gale Black before them, and the entire CCA Board and Committee Chairs have done over the past years. My wife Rita and I moved to Crestwood a little over 5 years ago for the people that live here, and the people of Crestwood continue to inspire me. The new CCA Board already has a lot of ideas for the Association, most of which involve making the Association work for YOU! What can we do better? What do you feel the Association is missing? I want to know! Please email me at pik@georgetown.edu with any comments, ideas, or issues you may have, or just to say hello. I want to get to know every Crestwood resident if I can - it would be an honor to know such a great group of neighbors. But there is one person that has made this whole experience fun, exciting, and worthwhile already - Karen Howard. Karen, you are one of a kind, and I thank you for your leadership. Interested in helping? We're always looking for neighbors to get involved, including as Block Captain Program lead, DC Issues Lead, project leads, and on other committees. Even if you just want to learn more drop me a line. There's a lot more to come, which I hope you will be excited about - stay tuned. See you all at the July 4th Parade! Re-elected First Vice President and Green Team Lead Doug Barker presented a proposed resolution of the CCA relating to DDOT's streetlight replacement project. The Resolution, which was approved by the membership present, states that the CCA recommends that DDOT adopt warm-white 2700 Kelvin energy-efficient LED lighting for all streetlight installations as opposed to the currently-used blue-white 4000 Kelvin lights, in part based on the American Medical Association report on Human and Environmental Effects of Light Emitting Diode (LED) Community Lighting. For more information, please contact Doug Barker at dougabarker@yahoo.com. SMD 4A08 Commissioner Gale Black presented the (SMD) 4A08 Meeting Survey Results, which detailed the issues that Crestwood residents have identified as their top issues, and also included what residents like about Crestwood. Commissioner Black noted that the two issues that are currently being focused on are contractor parking at Carter Barron and the Blagden Avenue/Mathewson Drive sidewalk proposals. These issues will be discussed at the June 6 ANC meeting mentioned below. Commissioner Black also discussed the request that was made to alter the part of Beach Drive that will be closed during the next phase of construction so that Crestwood residents may maintain access through Blagden Avenue to west of the Park. For a copy of the survey results, please email Pavan Khoobchandani at pik@georgetown.edu. You will be hearing more from our new Board members soon! We hope to get to know everyone better over the next months. Representatives from The Parks at Walter Reed and the District of Columbia International School (DCI) presented updates regarding the status of construction. The Parks at Walter Reed is a mixed-use, 66-acre redevelopment of the former Walter Reed Army Medical Center. The Master Development Team consists of Hines, Urban Atlantic and Triden Development Group. The representatives discussed the traffic study and mitigation plans, the retention of "green" space, and plans for demolition of the existing hospital. DCI representatives presented the plans for the school construction and a description of the grade 6-12 school. For more information, visit www.walterreedtomorrow.com or dcinternationalschool.org. 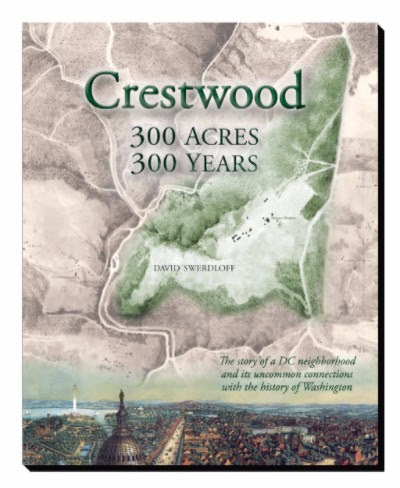 Crestwood: 300 Acres, 300 Years relates the history of our neighborhood with the help of more than 200 vintage photographs, maps, documents and news articles. This 132-page book, written by Board member David Swerdloff, costs $20, with all proceeds benefiting the Crestwood Citizens Association. To order, please contact John Favazzo at jfavazzo@gmail.com. The Association approved a Bylaw change that allows members of the Board to attend Board meetings by telephone, as well as changes the number of directors required to constitute a quorum and provides for the automatic resignation of a Board member that misses to consecutive duly-called Board meetings. The Advisory Neighborhood Commission 4A, which includes the Crestwood Single Member District 4A08, meets on June 6, 2017 at the police station at 6001 Georgia Avenue, NW at 7:00 PM. The ANC 4A meets on the first Tuesday of every month. Please feel free to contact any Board member or crestwoodcca@gmail.com for more information.